An emotionally remote recovering alcoholic and his dowdy, unambitious wife face a personal crisis when they take in an attractive lodger. A rooming house landlady recalls her past in flashbacks. Grace, newly widowed, has a youthful spirit which puts her at odds with her daughter and son-in-law who are on the stodgy side. She handles things with a sweet spirit that men find attractive especially grave digger Herbert, who wants to be her boyfriend. A Wonderful Comedy Never Equalled And Never Given A Chance! I saw "A Touch of Grace" when I was 13 years old. 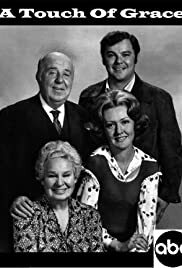 I didn't know the distinguished staff involved in creating and producing "A Touch of Grace" but I know that Shirley Booth and J. Pat O'Malley were sublime in their roles, old in years but never old in their acting nor in the plots the series played with. Actresses should end their careers in projects half as worthy as "A Touch of Grace". How sad that in today's youth-obsessed culture (even more so than in 1973 when this series premiered), networks don't believe that a "believable" situation comedy about being older in the United States wouldn't attract a wide following. I remember ABC, the network it ran on, didn't do well by the series, running it up against "All In The Family" and "The Mary Tyler Moore Show", among others. It was in a no-win situation. Few situation comedies could be considered sublime. This was and the work of all four principal players was some of their best work ever (especially that of Marian Mercer and Warren Berlinger). Well, at least, one of the great stars was hand-tailored a show for her in her seventies and was a great hurrah for her to go out on. I hope it will be available for viewing soon.